If you love the power of the Dodge Charger or Challenger Hellcat, but want the flexibility of a truck, there’s great news ahead from RAM™. 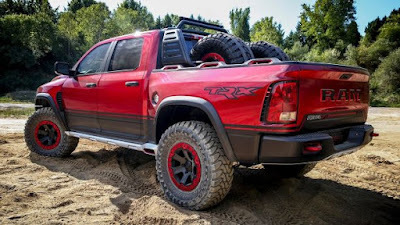 Word from inside the automotive world says that RAM will soon launch a RAM 1500 inspired by the Rebel TRX concept truck from a few years ago. This truck, planned to be the most powerful pickup made, would be offered in a 520hp 7.0-liter V8 engine (“The Banshee”) or the 707hp supercharged V8 engine that’s currently available in the Dodge Charger and Challenger Hellcats. The super-powered RAMs are expected to arrive for the 2021 model year (not that far away; we’re already in the 2019 model year for RAM!) It’s expected to take after the RAM Rebel TRX concept truck in its styling. As the #1 selling Dodge and RAM dealership in New Mexico, Melloy Dodge will be a source for these Hellcat-inspired RAM trucks. Be sure to follow our Facebook page for updates as we know more, or visit the dealership at 9621 Coors Blvd NW, just north of Paseo del Norte, in Albuquerque to learn more about the upcoming RAM trucks.